This article elaborates on the concept of thick analysis, introduced in 2010 by EVERS and VAN STAA. 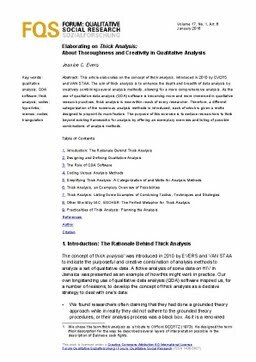 The aim of thick analysis is to enhance the depth and breadth of data creatively combining several analysis methods, allowing for a more comprehensive use of qualitative data analysis (QDA) software is becoming more and more immersed research practices, thick analysis is now within reach of every researcher. Therefore, a categorization of the numerous analysis methods is introduced, each of which is given a designed to pinpoint its main feature. The purpose of this exercise is to seduce beyond existing frameworks for analysis by offering an exemplary overview and listing of combinations of analysis methods.